Please allow a little time for us to process these if you intend to renew your licence over the longweekend period as we may be busy. Rivers - ONLY 2 weeks to go All general trout streams are now closed to all fishing until Saturday the 2nd of October 2004 ( Start of the October longweekend).However our lakes are open all year round with some of most consistent conventional fishing on Lake Eucumbene and Lake Jindabyne occuring over winter. The reports just keep getting better - with some great ones in over the weekend.For a change I'll post a few as they came in with photo's this week. 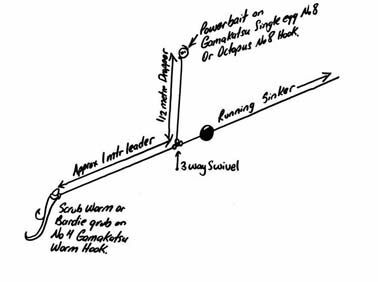 Most on lures trolling or casting from boat (tassies, squidgies, small minnows). Thought I would send you some shots of the fish Bill and myself caught from Eucumbene over the week (dropped in and told you yesterday, 28 fish). Gday Boys,Thought you might like these photos of my recent day (Sunday 19th Sept) trolling at Buckenderra, Ended up landing 5 fish over a seven hour session using your own Alpine Angler cobras in the bronze colour and also the brown trout colour Halco RMG diver, 3 x browns & 2 x rainbows, all good fish with the biggest weighing 2.7kg. All browns were full of yabbies and in pristene condition, please find the following photos taken on the day. One special photo was my 4 yr old daughter trying to lift the biggest of the browns. Colin Myles and Bill Huber trolled out form Buckenderra with Stump Jumpers,Merlins and our own Alpine Cobras in the black hole and Tassies in Col S12 and 89 for 20 fish averaging 1kg - with the best brown going 1.5kgs. Rodney and Phil from the Vickings fishing club did well out form Old Adaminaby with 5 Browns and 2 rainbows to 2kgs using "Sting" cobras in Col 54 & 53.Dave and Ted also from the Vikings caught 3 Browns and 6 rainbows averaging 1kg with their best brown going 2.3kgs using Stings in Col 53 and Duel depht Tassies in Col S12.Barry and Rod Woodwood also did well on the Stings in Col 53 for 3 Browns and 2 rainbows to 2kgs. Matt Taylor and Bill Karayannis from Sydney fished out from Breamar around Tolbar , flatline trolling with Rebel crawdads & Rapala minnows for 28 fish to 1.6kgs.Generally the best colours in the Tassie's have been Col S12,Y82,YFR ,89 & 55.Our own Alpine Cobras have also developed quite a following with the Alpine Attractor, Pink wings, black hole and midnight special all fishing well of late. Minnows are also always worth having in your spread with RMG Scorpions, baby merlins, Attacks and Rapala's all worth a swim. Best colours are rainbow and browns trout patterns, tigers and pink/violets. The rebel crick hoppers also continue to fish well with the black one being the pick along with the Smilin jack version in black/gold. Running 3 colours of leadline can also help pull a few fish through out the day, getting your lures down around the 3 metre mark.We've also added Stump Jumpers to our range this season with quite a few good reports coming in from those who troll with them on the trout.We also have some great new "Frenzy" lures in a range of great colours at ONLY $6.95 each - chech them out next trip !